Computer Science Activity Day. The image was taken by and is belong to The University of Nottingham. Students were Playing with Poppy. The image was taken by and is belong to The University of Nottingham. 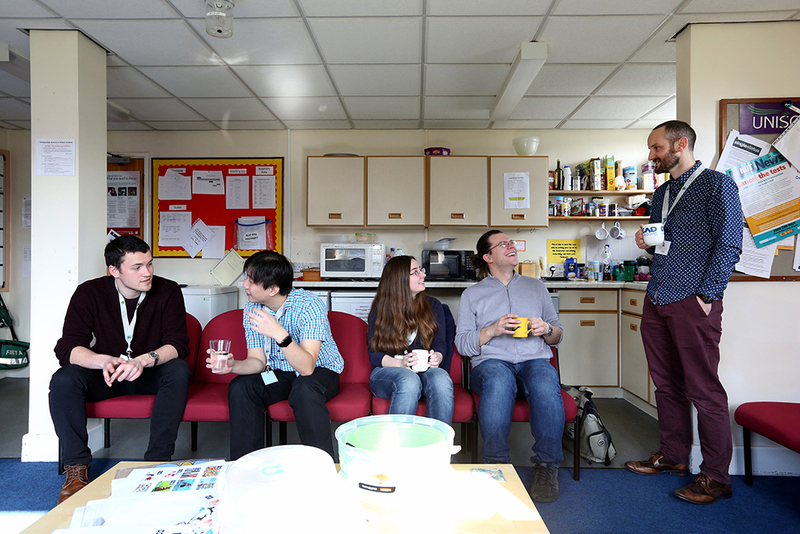 For the third year, academics and students from the School of Computer Science of University of Nottingham went out to the school to put together fun computer science activities designed to get the children excited about programming, technology and computing. One of the activity was The Don’t Smile Game with two of ERiSA game companions with me and Tjaart Broodryk. In this activity, the students played a simple game called “Don’t Smile”, with social game agents which are capable of perceiving the player’s emotions. The goal of the game is simple: make the computer smile and laugh with jokes, and funny facial expressions. The first contestant to smile uncontrollably loses. 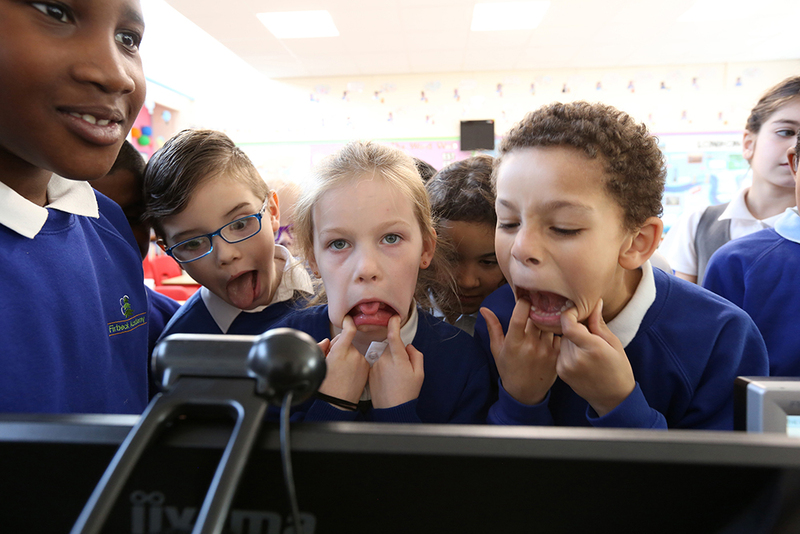 Through the activity, the students also learned about emotions – what are emotions and feelings, how we as humans can perceive those emotions and how a computer can understand such emotions. For detailed information about the study can be referred to here and for more information about the activities on Firbeck Academy can be found on here. The image was taken by and is belong to The University of Nottingham. The UoN Mayfest is an annual event held by The University of Nottingham. It’s open for public for throughout the day. In this event, people can enjoy the beauty of the campus and get to know the activity we’re doing in the University. All Schools in the University are generally invited to provide some activities to the public, be they research highlight, introduction to science, sports, etc. In this year, we were lucky to had a chance to show our virtual humans system, ERiSA to the public and play a simple social game called The Don’t Smile Game, where two people facing each other and try to make each other laugh by telling jokes or pulling funny facial expressions. The first person to smile uncontrollably loses. In the game, we use two characters, Poppy and Spike as the game companions. Poppy has a high extraversion and low neuroticism personality (PE = 0.5, PN = −0.1, while Spike has a high neuroticism and low extraversion personality (PE = 0.2, PN = 0.5) and decay rate r to 0.02 for both game companions. We based our model on the OCEAN personality model. The values of the traits are represented by a set of real numbers between -1 to 1, where 1 represents the strongest possible value in that particular trait. There were four phases of the interaction: Opening, Chit-Chat, Game, and Closing phase. 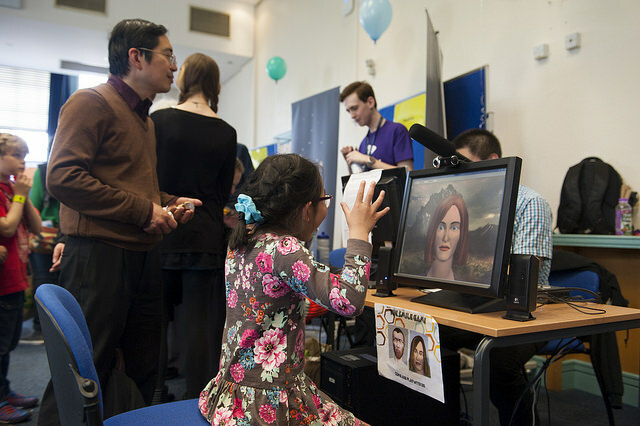 The Opening Phase is a phase where the participant initiated their interaction with the virtual game companion. In this phase, the virtual game companion greeted the participant and asked the participant’s name (if the virtual game companion hadn’t met the participant before). Afterwards, the virtual game companion initiated a small chit-chat using “evaluating the day”, weather, or news dialogue (Chit-Chat Phase). The next phase was the Game Phase where the participant and the virtual game companion played the game trying to make each other laugh by making weird facial expressions, funny body movements and jokes. Finally, the virtual game companion evaluated the game and said goodbye after they finished the game (Closing Phase). We had more than 50 participants who played with the game companions. For detailed information about the study can be referred to here and for more information about the UoN Mayfest can be found on here.